To commemorate Nelson Mandela’s 90th birthday, we are going to take a look at why he became such a globally recognised figure. How many of you were born before February 11th 1990? If you were, you would have been around when Mandela was released from a South African Prison, after spending 27 years of his life there, longer than all of you have been alive! 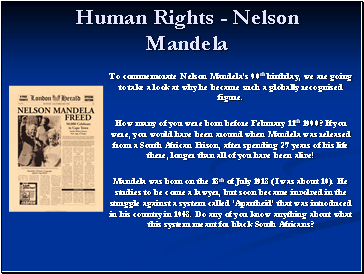 Mandela was born on the 18th of July 1918 (I was about 10). He studies to be come a lawyer, but soon became involved in the struggle against a system called ‘Apartheid’ that was introduced in his country in 1948. Do any of you know anything about what this system meant for black South Africans? 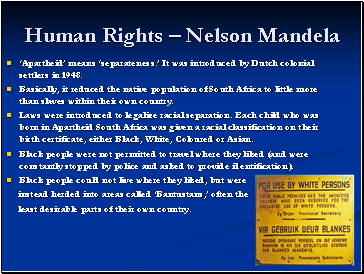 ‘Apartheid’ means ‘separateness.’ It was introduced by Dutch colonial settlers in 1948. Basically, it reduced the native population of South Africa to little more than slaves within their own country. Laws were introduced to legalize racial separation. Each child who was born in Apartheid South Africa was given a racial classification on their birth certificate, either Black, White, Coloured or Asian. Black people were not permitted to travel where they liked (and were constantly stopped by police and asked to provide identification). least desirable parts of their own country. Protest was outlawed. Anyone caught organising a demonstration, reading banned newspapers or speaking against the Apartheid system was in danger of being detained without trial, tortured, imprisoned, even sometimes murdered. That is, until the Sharpeville Massacre in 1960. 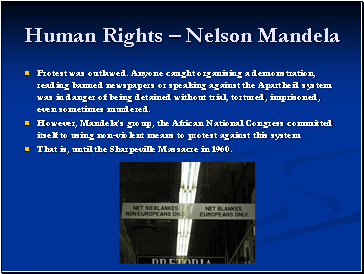 The Sharpeville Massacre took place on March 21st, 1960. 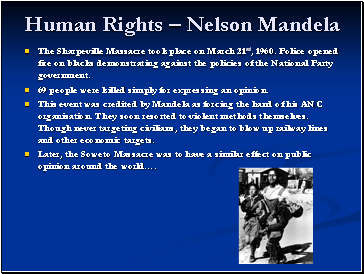 Police opened fire on blacks demonstrating against the policies of the National Party government. 69 people were killed simply for expressing an opinion. This event was credited by Mandela as forcing the hand of his ANC organisation. They soon resorted to violent methods themselves. Though never targeting civilians, they began to blow up railway lines and other economic targets. 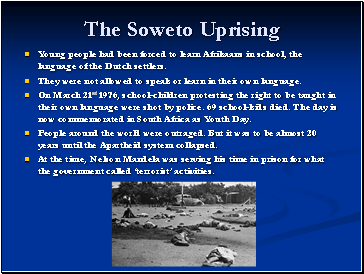 Later, the Soweto Massacre was to have a similar effect on public opinion around the world….